The downward spiral of one man’s story pulled me into a world of uncertainty and intrigue. The descent kept me turning page after page in hopes of discovering his escape from certain death. As we hit the bottom, the story concluded, and the downward spiral reversed its course. If you mixed together the stories of The Sopranos, Law & Order, and Prison Break, the blend would be called Slip and Fall. It is a story about one man, Robert “The Prince” Principe and his descent into the hands of the mob. The cards are not in his favor, and stuck between a rock and a hard place, Principe steps into their grasp, only to be pulled further in with no chance of stepping out. Caught in the vice of the mob, he has no choice but to push the limits of his stature as a lawyer and hope to escape with his life, as well as the lives of those close to his heart. Slip and Fall was written by Nick Santora, who merges the world of fiction with the history of his life. Following in his footsteps, Principe attended Columbia Law School and married a woman named Janine, whose characteristics may reflect Santora’s own wife. With his experience in writing for The Sopranos, Law & Order and The Guardian and as the writer and co-executive producer of Prison Break, Santora brings Principe to life and created a world of family, dedication, and downfall. Fast-paced, intense, and heart-pounding, the story of Principe is addictive, and every page, every short chapter disappears in the blink of an eye. As the trial of his life derails and hangs in the balance on Justice’s scales, we are carried further into the book, into the life of the main character. As the conclusion nears, we can only hold our breath and wait in anticipation to see if Principe will survive the errors of his ways and be given the chance to redeem what he has done. 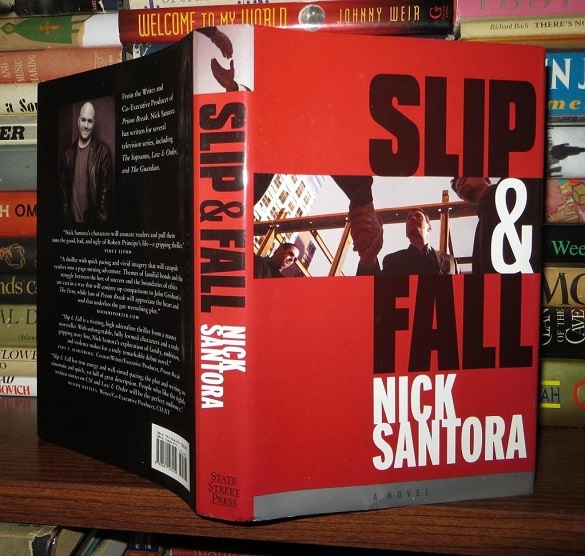 Slip and Fall lives up to the stories told in The Sopranos, Law & Order, and Prison Break. Its blend of storytelling is enthralling and brilliant. Its main character is one that stands out from the pages and one that will be remembered. The thirst to enjoy great stories has found a new taste, a new enjoyment, called Slip and Fall. This entry was posted in Archive, Literature, Recently Added, Reviewed. Bookmark the permalink.